So, my grand plans for a French-inspired potager wilted. 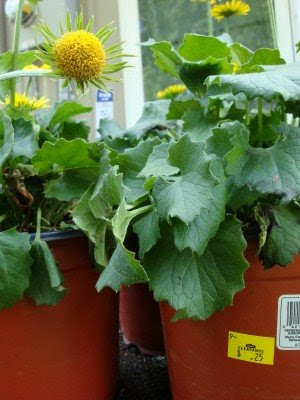 Much like these clearance cart perennials. Good thing there's a kiddie pool back there. We both needed a spot to refresh our roots. At what moment did I let go of my plans for my garden? Maybe the day I rescued a free basketball goal from the curb. Would I rather have my charming twig gate, or something that could unlock Andrew's confidence in sports? Should I design a formal herb parterre, or simple boxes that the kids could build together? Can I really schedule a Saturday of yard work when we could be backyard camping? Much as I hate to admit it, this is not a season of gardening for me. Join me this spring as I create a family space that respects our time and our budget. Let's hope the morning glory seeds cover that pole in no time! I too have had to consider my family and finances in planning my garden. The kids love to help me, although it is often at the cost of a few plants when they step on them. Our front garden is both flowers and food. We grow tomatoes, cucumbers, jalapenos and more. It is interspersed with lilies, daylilies, Japanese Maples, shrubs... We end up with a pretty and functional garden, as long as I plant enough to keep the weeds out. I also have to consider that I'm likely to be on restricted activity come September and October, and even if not, bending over with 2 babies in utero is not likely to be comfortable. So I hope to plant as much as possible, to keep weeds out, and get kids and hubby to help in the harvesting. You're right, your season will come. At our last house our retired neighbor spent every day meticulously maintaining his yard and often had suggestions for us on projects we could undertake, such as digging up and replacing the gutter drain line instead of simply flushing it out with a hose. My husband was anxious about "keeping up" until a friend told us "Relax, right now you are raising kids, not raising grass." How about giving the kids a box (closest to the basketball hoop) and then you can have the other 2 boxes? Let them tend to theirs as they please, and make sure they know that the other 2 are yours. I know, I know, easier said than done, but worth a shot. It was a struggle for me, too, this summer to let go of the big garden I had planned and realize that there is no way I could pull it off and grow this baby at the same time. So we have some flower boxes on the deck planted with a few little vegetables and herbs. And we'll see how it goes. beautiful. I love how you evaluated what to do on the basis of what was best for the family. And I like how in the end everyone will find joy in the process and results (however large or meagre). Inspiring. Absolutely can't wait to see what you come up with! Well said, Meredith. I long for a garden (I don't even have a backyard) but the truth is, we have so much more family time because we don't have yard work. I am glad my children play spors, other wise, the'd never get to see green grass! LOL! Love the bargains! 25 cents? Wow! I got some great bargains last week at Lowe's...rhubarb, onion sets, garlic sets and horsradish for 50 cents a bag! It made me very, very happy. I've also got some Morning Glory's planted...seeds from the 99 cent store at 11 cents a pack. Not bad! Bargain gardening at it's finest...good job, M! everyday is a lesson to me in letting go control and finding an in-between that works for our whole family. i posted a few weeks ago about our urban homestead, which is a small parcel in an urban setting, but into which we fit a whole bunch of needs and wants for our entire family. it won't get me anywehere near sunset magazine, but it works for us. I'm a long-time but quiet reader and just wanted to say how hard it is...I think you can have it all, but you just can't have it all at the same time. Good for you for realizing it! I really wanted a garden this year, too. I've always had tomato and pepper plants, but I wanted something more. It just isn't in the plan for me, though, and that it okay. My husband hasn't been gone a year yet and we're still dealing with grief issues. I decided that it was more fun to be able to go on family trips when invited than to worry about weeding a garden right now. Also, my son isn't able to get home to help me and the younger girls with building stuff. There are just some things I'm not strong enough to do by myself! That's okay. I still have all of my flowers and I think I'll plant a few trees instead of veggies. Great perspectiv! Don't make your garden too precious at this season in their lives. you don't want them calling it "mommy's garden" instead of "our garden" ... ask me how I know! And my hostas have survived several seasons of basketball and rollerblades. You can always do a small potager in a container or two out your back door. My Mother-in-law was a farm wife and raised her three boys on a farm. She used to tell me about a neighbor that had a beautiful farmhouse flower and vegetable garden. When my husband and his brothers were little, my mother-in-law lamented one day to this neighbor that she never seemed to have time to grow anything! This dear, sweet older lady (who, sadly, was killed along with her husband in a head-on collision a few months later), wisely told my mother-in-law that she was, indeed, growing something even more beautiful than flowers, and that she was working in a "garden" that would have fruit that would last forever. That's a greatly encouraging thought, isn't it? !It's something that I think about when I get frustrated about not being able to get very much done. Just do what you can do. That's hard when you want to do big, beautiful things, and "mommy responsibilites" keep side-tracking you every other minute! It's sure something that I struggle with sometimes. I know that whatever you and your kids end up doing with your gardens and yard will be beautiful and just right for your family! 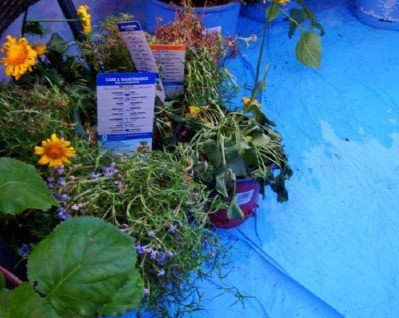 Great ideas for themed beginner gardens -- pizza garden, i think there is a moonlight garden, etc. I love your little gardens..so cute! Oh Meredith! I can picture you with a morning glory covered basketball pole. That's so you! The boxes look great. We have skipped gardening for several years except for basic lawn cleanup. My husband made 4 large raised bed rectangles a lot like yours when we first moved in about 10 years ago and they have gone dormant. My husband says they don't get enough sun due to our neighbor's hedges growing high but I don't quite believe it, something will likely grow there. I started a raspberry patch in one and may put more raspberry plants in a second. There's no hope for tomatoes but something will work there. 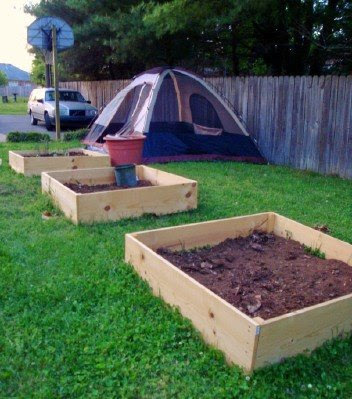 Have fun with your garden plans and backyard camping! (and the basketball hoop). Oh hey Meredith, you know what I see you doing? Making those neat stick teepee trellises. That is always something I wanted to make but never did. We have tons of sticks around here, I really should give it a try. Again, have fun with however it turns out! Your garden boxes have inspired me to palnt a few veg this year. I thought it wasn't practical in our yard since the entire perimeter is a continuous mulch bed. But we could put one of these boxes right on top! Do you have any instructions for building them? That would be most appreciated! We had a basketball hoop in our driveway when Christopher was younger. We still have lots of fun memories of he and his friends shooting baskets. We've decided to put in a very small raised bed garden this year. Anything else is too much work at THIS season of life. to everything there is a season.......doesn't this TOTALLY apply? You are doing the right thing, IMO. I love all the encouraging comments here about the little people we are "growing" at this stage of life. What a good and helpful reminder to me right now! My hubby is building a small wood frame for a 4 x 8 raised bed, and my oldest has really enjoyed the process of planting seeds in tiny indoor pots. Like many here, I won't have tons of time to garden, nor do we have much money to put toward it just now. Whatever I do, I hope to involve the children as much as possible. I look forward to seeing your "Kid-friendly" garden, Meredith! I get so much enjoyment from gardening with my children! I had to learn to bite my tongue when they pull out a tulip "just for Mommy." And does it really matter if all the seeds are in a straight line? They are learning to tell weeds from flowers and are more apt to eat what they helped grow.